Mandala stencils are very popular for today's DIY decor. And for good reason, as mandalas fit many decorating styles! 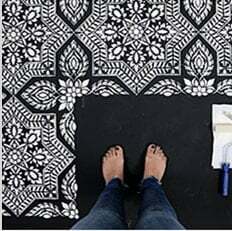 With this amazing Mystery mandala stencil, you can create a beautiful painted accent on any wall, ceiling or floor. Our original mandala stencils can be painted in one or multiple colors to match your decor. Mandala stencils are easy and fast to use despite there seeming intricacy. Perfect choice for a first time stenciling project. Our mandalas are original hand drawn designs created by stencil designer Janna Makaeva, and exclusive to Cutting Edge Stencils.